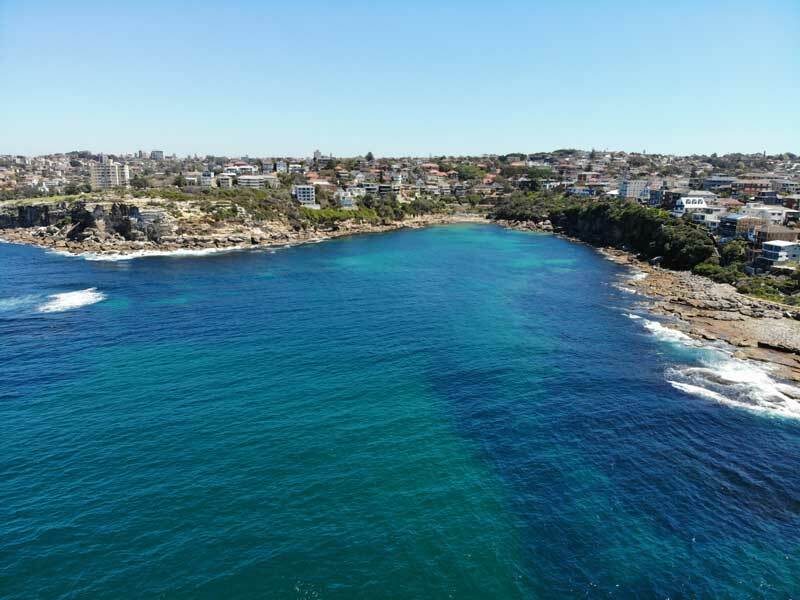 Michael McFadyen's Scuba Diving - Thompsons Bay The eastern Sydney suburb of Clovelly has three dive sites. These are Shark Point, Clovelly Pool and Thompsons Bay. 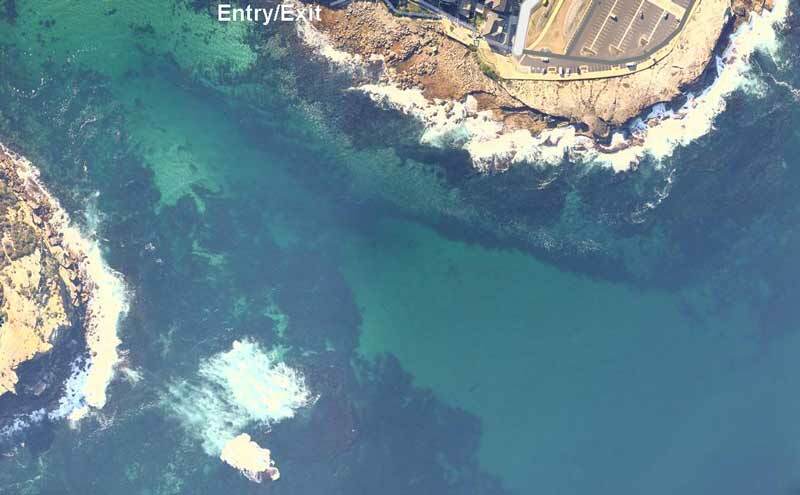 Located eight kilometres from the City centre, the site I am covering in this article is more correctly called Gordons Bay, although it is more popularly known as Thompsons Bay or just Thommos, although these names do not appear on any maps of the area. Apparently the bay was originally named after the Government Surveyor, Lewis Gordon. In 1840 he was granted 40 acres of land in the Coogee/Clovelly area and the bay was included. Its other name comes from John Thompson who was the Mayor of Randwick in 1873. He built the first home in the area. In the period 1989 to 1991 I dived Thompsons Bay quite regularly and usually had a good dive. However, since then the quality of the dive has dropped dramatically in my opinion. An article in the Sydney Morning Herald in the mid-1990s commented on this change and put it down to spearfishing of virtually all the smaller fish by people. I do not know if I agree with this theory, as I do not see that many more spearfishers here than other similar sites. As my first awareness of the fall of this site coincides with the installation of the chain guide around the site, my own theory is that this has somehow affected the fishlife. It is possible that galvanic reaction between the metal of the chain and other objects has created a minute electrical current that has acted like a barrier to fish. Another theory I have is that divers have killed all the sea urchins (to feed to the gropers) here and that this has permitted the kelp to overgrow all the rocks and smother the sponge and other life (this has certainly happened at other popular shore dive sites like The Gutter at Shellharbour). At least it sounds good! This dive site also has a gruesome history, with many bodies found in the water here by divers. The most strange was a Police officer who in the 1990s committed suicide by chaining himself to one of the concrete blocks and then proceeded to run out of air. Even stranger, it appears a few days earlier he tried the same thing but decided to abort the attempt, unlocking the padlock. The second time, he did not take the key! Access to Thommos is via the southern end of the Clovelly Beach car park. Depending upon the sea conditions, entry and exit can be made from the natural ramp at the end of the pathway which starts to the west of the car park. Start the dive from the ramp and head due south. Once you hit the sand, follow it to the east for a while, then back west past where you met the sand. A bit further on you will see a small wall ("The Wall") on your right. This is about the only interesting section of the dive. There used to be a conger eel living here (it was there for at least five years from 1989) but I do not know if it is still there. This spot is right at the head of the sand spit. You can head back to the starting point from here by heading a bit east of north. An alternative is to follow the sand edge as it turns back to the west and runs out towards the sea again. This time you are on the southern side of the sand. There is a bit of interesting reef here and a small bombora. You can head back to your starting point by crossing the sand and then heading due north. This dive usually has good visibility, although it is better on the incoming tide, and provides an extremely good day or night dive. Maximum depth is approximately 12 metres at "The Wall". Night navigation can be assisted by remembering that you can see the street lights to the north-west from below the water. Groper, moray eel, mado, old wife, maori wrasse, garfish, red morwong, six-spined leatherjacket, velvet leatherjacket, spotted goatfish, painted rainbow wrasse, crimson banded wrasse, senator wrasse, eastern foxfish, one-spot puller, striped seapike, common bullseye, sergeant baker, silver sweep, abalone, shrimp and white ear used to be seen here during the day. Nowadays, not so many can be seen. At night you used to see crayfish, common bullseye, sand whiting, velvet leatherjacket, silver sweep and baby sharks as well as most of those seen during the day. All in all, not really worth the effort unless you are particularly desperate. In September 1998 (and 2001, 2002 and 2005) I dived Thommos again. The dive was very boring at depth (12 metres) but in the shallows on the north side it was better, with a lot of bream and luderick. There was heaps of kelp at depth whereas back around 1990 there was hardly any kelp here. I believe that this has been caused by divers killing sea urchins (there are none to be seen here). In the shallows there is little kelp and many urchins. I dived here again in March 2001 and again had a very boring dive. I will never dive here again.